There is nothing "Peaceful" about the Pinans! In this article I want to challenge some of the commonly held beliefs about the Pinan / Heian series. Although frequently viewed as kata for children or beginners, it is my belief that the Pinan series represent a holistic and frequently brutal combat system. To establish why I believe that to be true, the first thing I want to call into question is the commonly accepted meaning of “Pinan”. 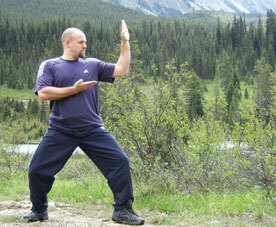 If you were to consult almost every karate book in existence they would tell you that “Pinan” means “peaceful mind”. However, some of my research leads me to conclude that this translation is incorrect. Pinan (Heian) is written using two characters. The first character is pronounced “ping” in Chinese (Mandarin), “pin” by the Okinawans, and “hei” in Japanese. The character originates from a pictogram denoting plants floating on the top of water and means “flat, level, even; peaceful, clam”. The second character, which is pronounced “an” in all the languages mentioned, originates from a pictogram denoting a woman underneath a roof and means “peaceful, tranquil, quiet, content”. It's when we combine the characters that things get interesting. In Japanese, the two characters together would be pronounced as “Heian” and would translate as “peace and tranquillity”. However, every karate resource that I have consulted states that “Pinan” (Heian) means “peaceful mind”. A translation of “peaceful” I can understand as it could be taken as a legitimate alternative to the literally correct “peace and tranquillity”; but where does “mind” come into it? There is no character for “mind” in the writing of Pinan / Heian. In his book Karate-Do Kyohan, Gichin Funakoshi – who was a student of Anko Itosu; the founder of the Pinan kata – says of the Heian kata, “Having mastered these five forms, one can be confident that he is able to defend himself competently in most situations. The meaning of the name is to be taken in this context”. This explanation of the name does not make sense with the literal translation of Heian (Pinan). 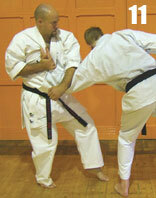 Why would Itosu choose to name his kata series “peace and tranquillity” to reflect their holistic combative nature? There is nothing peaceful or tranquil about defending oneself! The Funakoshi quote is where I think the mistranslation of “peaceful mind” comes from. The word “mind” is added to reconcile the literal translation and the explanation of the meaning i.e. because these five forms can give you confidence in your ability to defend yourself in most situations, your mind can be peaceful. I feel it's still a bit of a stretch; however, I could accept that explanation if it weren't for that fact the characters do not read as “peaceful mind” they read as “peace and tranquillity”. So how are we to make sense of Funakoshi's explanation of the name? At the time Itosu created the Pinan series, “karate” was written using the characters for “Chinese” (pronounced “kara” or “to”) and “hand” (pronounced “te” or “de”) giving us the readings of “karate” or “tode”. It was when the art spread to Japan that the character for “empty” (which can also be pronounced as “kara”) was widely substituted in order to make the art easier to promote in mainland Japan. The Okinawans regarded all things Chinese, to quote Funakoshi, to be “excellent and fashionable”. However, this positive view of all things Chinese was not shared on the Japanese mainland at that time. It was for this reason that a subtle name change was felt to be appropriate. It was also at this time that the kata were given Japanese names by Gichin Funakoshi – the names used in Shotokan – to replace the original Chinese / Okinawan names. Itosu, as an Okinawan, will have taken pride in the Chinese origins of the art he practised. Itosu was also employed as a scribe by the Okinawan king and was an expert in the Chinese classics. If you consider that when Itosu created the Pinan series, it was before the art had reached mainland Japan; the art was called “Chinese-Hand”; all things Chinese were held in high regard by the Okinawans; that no other kata had a Japanese name; and that Itosu was an expert in Chinese literature; it seems highly improbable that he will have been thinking along Japanese lines when naming the kata series he created and infinitely more likely that he was thinking along Chinese lines. Now here is the interesting bit: whilst the characters for Pinan / Heian are read as “peace and tranquillity” in Japanese, they mean something different when read in Chinese. The Oxford dictionaries are arguably the ones held in highest regard in the study of language. The Oxford Chinese-English dictionary states that, when combined together, the characters used for writing “Pinan” and “Heian” mean “safety” or “safe and sound”. Similar translations of “free from danger”, “safe from danger” and “safe from harm” have also been given to me by speakers of Mandarin. These translations all communicate the same sentiment and are in effect interchangeable. To keep things simple we shall settle on “safe from harm” for the purposes of this article. We have seen that a Chinese reader will not translate the characters as “peace and tranquillity” – as a Japanese reader would – but is instead more likely to read them as “safe from harm” (or one of the alternatives). I believe “safe from harm” to be the reading Itosu intended to be attached to his creations. Of course, we can't be 100% sure what meaning Itosu had in mind when naming his kata series. However, to my mind the Chinese reading of “safe from harm” makes much more sense when you consider that art was considered Chinese at that time and that none of the kata had Japanese names. Add to that the fact that Funakoshi tells us the name was chosen to reflect that the fact that the five Pinan kata will enable us to defend ourselves competently in most situations – it is reasonable to assume that Itosu communicated the reason behind his choice of name to Funakoshi during his instruction – and I feel the case for “safe from harm” is infinitely stronger than the universally accepted, though undeniably incorrect, translation of “peaceful mind” (the characters are not read as “peaceful mind” in any language). I would expect that Funakoshi himself will have been familiar with the Chinese reading of the characters. As a member of the Shizoku (Okinawan upper class) it was regarded as essential that Funakoshi should receive instruction in the Chinese classics. Funakoshi tells us he received such instruction from both his grandfather and Anko Azato (a friend of Anko Itosu and Funakoshi's other main karate teacher). Funakoshi also tells us he was encouraged to read the Chinese classics from an early age and that later in life he was employed as teacher of the Chinese classics. I therefore feel confident that Funakoshi will have had an understanding of the Chinese reading of the characters, as well as the Japanese reading. When Funakoshi took karate to mainland Japan he came up with alternative names for most other kata (Kushanku became Kanku, Naihanchi became Tekki, Seishan became Hangetsu, etc.) in order to help promote the art in Japan. However, there was no real need to come up with a new Japanese name for the Pinan kata as they have the existing reading of “Heian”. It's also worth remembering that both languages (Chinese and Japanese) will use the same characters to write the name, and the meaning will be interpreted depending upon the language of the reader (i.e. a Chinese or Japanese reader). It is only when translated into English that all ambiguity is removed. Funakoshi will probably have understood both readings, and although he promoted the Japanese pronunciation, his explanation of the name would seem to be in reference to the Chinese reading. Funakoshi tells us that the name should be understood in reference to their holistic combative nature. The Chinese reading fits perfectly with Funakoshi's explanation, whereas the Japanese reading does not (unless you mistranslate and add in “mind, and even then it's a stretch). Indeed, the fact that Funakoshi says “The meaning of the name is to be taken in this context” seems to be an instruction that the reader is to understand the characters in their Chinese context, as opposed to how the Japanese reader would otherwise read those characters. Personally I'm convinced that “Pinan” should be read as “safe from harm” and that the almost universally accepted translation of “peaceful mind” is incorrect. To be clear, “Heian” most definitely does mean “peace and tranquillity” in Japanese. However, it is my belief that Itosu intended for the Chinese reading of “safe from harm” to be the one attached to his creations. The Pinan series are kata that will keep us “safe from harm” and hence give the practitioner of these forms the confidence that he is “able to defend himself competently in most situations”. I am aware that this view is potentially controversial and to my knowledge I am the only person to who has suggested this alternative theory to the widely accepted “peaceful mind”. However, by suggesting it, I hope that others will look at the evidence for themselves and come to their own conclusions. This reading, and Funakoshi's explanation of the name, also has a bearing on the notion that the Pinan kata are children's or beginner's kata. I agree with Funakoshi that these kata are a holistic self-defence system and I also believe that they represent a pragmatic summary and restructuring of the methods know to Itosu (hence his choice of name). As the title of this piece states, there is nothing peaceful about the Pinan kata! Another commonly held belief about the Pinan series is that they were created for children when Itosu began teaching karate in Okinawan schools. It's certainly true that the kata were taught to children (without their applications), but I do not believe they were created for that purpose. It would be too lengthy to discuss the evolution of the Pinan kata here. I'll reserve that for the book I'm currently working on. However, what I'd now like to do is look at a couple of applications from the Pinan series that will illustrate the kind of combative methods contained within those forms. The first time I trained with leading realist Geoff Thompson he explained how the jaw line was effectively the body's off switch and was the number one target for punches. In order to demonstrate this, and so everyone could feel it for themselves, he lined everyone up and then worked his way down the line giving everyone a tap on their jaw. When it came to my turn, Geoff tapped me on the side of the jaw, everything briefly went black, and I staggered back. I noticed the angle of Geoff's punch and asked if he had personally found that angle to be any more effective than other angles in his hundreds of real fights? He said no and asked me to clench my jaw again. Geoff tapped me on the front of the jaw, everything briefly went black, and I staggered back. I then ask if he had found coming from underneath to be any more or less effective than hitting the jaw from the horizontal. He said it was just as effective and asked me to clench my jaw again. Geoff tapped me on the underside of the jaw, everything briefly went black, and I staggered back. I then look along the line to see everyone looking back at the idiot who keeps asking to be punched (I'm a slow learner!). I then smile at Geoff saying I have no further questions. Geoff smiled back and continued with his teaching. So the first time I train with one of the world's leading realists, one of the key physical skills he taught was hitting the jaw line from various angles. I think this is the first thing that Pinan Shodan teaches (as well as how to get the arm out of the way to allow clear access to the target). I find that the old masters and modern realists are often much closer in their thinking than the old masters and many modern “traditional” karateka. In Figures 1 to 3 you can see the first three moves of Pinan Shodan (Heian Nidan). To deliver an effective uppercut from the outside it is important that the opponent's arm is lifted high enough in order to ensure the arm does not prevent you from driving through the target (Figure 4). In the original edition of Karate-Do Kyohan, in the section on throws, there is a picture of Funakoshi delivering a variation of this strike to the jaw of Otsuka (founder of Wado-Ryu) prior to the execution of a “turning swallow” throw. 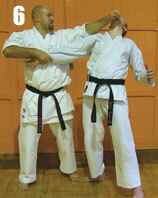 The second motion of the kata shows how to hug the arm in so the back hand can cleanly strike the side of the jaw (Figure 5). In Karate-Do Kyohan, Funakoshi says of this movement “pull your opponent closer to you with your left hand and deliver a blow to the side with your right”. This application is in line with Funakoshi's guidance for this motion. The final motion pulls the opponent's arm down to show how the tip of the jaw can be struck with a hammer-fist (Figure 6). Notice how this sequence shows the three angles from which the jaw can be struck (underneath, side and front) and how the non-striking arm is used to clear any potential obstructions (one of the key uses of the non-striking hand in kata). 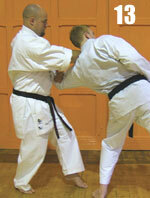 Although most karateka have abandoned the traditional teaching order of the Pinans – Pinan Nidan being commonly taught first in Wado-Ryu and Shito-Ryu and the names being switched in Shotokan (such that Pinan Nidan became Heian Shodan) – there is a good reason to stick to the traditional order as the bunkai progresses in a logical order and teaches the required physical skills in a logical way. In my forthcoming book I'll explain this fully, but for now I'd like to compare the first few motions of Pinan Shodan with the first few motions of Pinan Godan. The first three moves of Pinan Godan are shown in Figures 7 to 9. Those motions are then repeated on the other side before a “soto-uke” (Figure 10) is delivered to the front. These motions are commonly thought of as a block and punch to the left, a block and punch to the right, and then a block to the front (the back hands are given no function). One of the mistakes with interpretation is the common misunderstanding that the angles represent the angle of attack. We all know that getting to an angle with the opponent is an important part of combat. When performing a solo kata we don't have a second person to establish the angle for the technique, so we have to use the centreline or our previous position. The angles in kata tell us the angle we should be in relation our opponent when applying a technique. 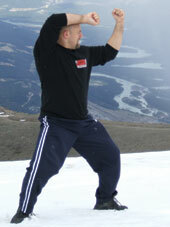 Aside from the fact it is common sense, there are also some literary references to the fact that the angles in the Pinan kata show us the angle at which we should apply the technique (Kenwa Mabuni – founder of Shito-Ryu and a student of Itosu – argues this point in his book Karate-Do Nyumon). The opponent has grabbed your clothing. Shift at a ninety degree angle to take you away from any potential punch. 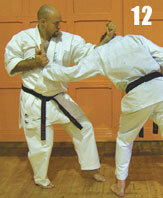 As you move, you should smash your forearm on the opponent's arm to disrupt their posture (Figure 11). This is the application of the “priming motion” for the “block”. Smashing your arm into the opponent's forearm will also set them up for a forearm strike to the base of their skull (Figure 12). You should then seize your opponent's arm, in order to keep the opponent close and his posture disrupted, and deliver a punch to the side of their jaw (Figure 13). Both the forearm strike to the base of the opponent's skull and the punch to the jaw have the potential to knockout the opponent. 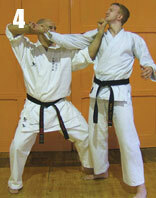 However, if they are still conscious, the kata advises us to step in and crank the opponent's neck (Figure 14). This is obviously a very dangerous technique and great care should be taken when practising it (which could be the reason the motion is performed slowly in the kata?). 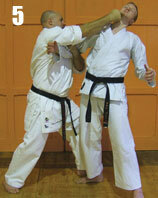 The kata then show the sequence to the other side. If the opponent is still not finished off, the kata advises us to secure a grip on their clothing, step forward and deliver an elbow strike to their face (Figure 15). This is the function of the “soto-uke”. You'll notice how the first three motions of Pinan Shodan simply show three ways to access and strike the jaw-line; which is an important lesson that you would teach a beginner. Conversely, the start of Godan is a flowing combination that demands continuous control over the opponent and as such is more advanced. The Pinan series is structured such that everything is taught in the right order. To fully explain and demonstrate this, we would need to break down every move and show what each one teaches, and that is obviously not possible in an article such as this. However, in my forthcoming book on the Pinan /Heian Series I will be doing just that. For almost every combative skill required in the civilian environment, the Pinan series presents a structured and logical progression. The Pinan series is structured such that everything is taught in the right order … providing we stick to the traditional order! Although the characters for “Pinan” are read as “peace and tranquillity” in Japanese, they can also be read as “safe from harm” in Chinese. It is much more likely that Itosu had the Chinese reading in mind when naming his creations. This Chinese reading also fits with Funakoshi's explanation of the name, “Having mastered these five forms, one can be confident that he is able to defend himself competently in most situations. The meaning of the name is to be taken in this context.” The bunkai examples covered in this article will hopefully also demonstrate that there is nothing “peaceful” or “tranquil” about the Pinan series and they can indeed keep us “safe from harm”. In this article we have questioned the common translation of “Pinan”, called into question the modern teaching order, and hopefully established that, far from being children's kata, the Pinan kata represent a holistic self-defence system. I hope that you've found this article interesting and that they have encouraged you to examine the combative applications of the Pinan / Heian series in greater depth.